First class merchandise vs. "seconds"
What constitutes a flaw in crystal? Is a "seed" or bubble in crystal stemware a flaw? Should all pieces of crystal be identical? Is a line or "cord" a flaw? How can I unstick a decanter stopper? How can I remove stains from a decanter or a vase? Can crystal be cleaned in a dish washer? Which Lismore Stemware do I have? What is Marquis by Waterford Crystal? What do different colors of roses mean? What is a right gift for an anniversary? We will accept items for exchange or returns for a full refund, less shipping costs or restocking fee where it applies, within 30 days from the date of purchase, except during Holidays (see below). The date of purchase is the date your order was shipped out. The items to be returned or exchanged have to be unused, in their original condition, in their original box and properly labeled. Sales of orders shipped by truck, or common carrier are final. Sales of discontinued, discounted and sale item are final. Sales of engraved items are final. Christmas ornaments will not be accepted for returns after December 1st. All credits for returned merchandise will be issued back on the same credit card the order was charged on initially. Checks returned to Crystal Classics for the lack of funds in the account are subject to $45 service fee. We are not responsible for shipping charges incurred to send the product back for return or exchange. We reserve the right to charge a 20% restocking fee on returns on orders over $2500. There are no exceptions to this policy. All orders shipped between October 1st. and December 31st. may be returned or exchanged until January 31st. for a full refund, subject to our return guidelines. If you reside, or the shipping address is outside Ohio, we will not charge you Sales Tax. Combined with our Free Nationwide Shipping service this option creates a great value. All you pay is the price of the item. Credit Cards - We accept American Express, Discover, MasterCard and Visa. PayPal - All orders paid with PayPal are charged immediately at order submission. PayPal, the trusted leader in online payments, enables buyers and businesses to send and receive money online. PayPal has over 165 million member accounts in 55 countries and regions. It's accepted by merchants everywhere. Amazon - Use your Amazon login to pay and choose shipping addresses that are saved in your Amazon account! Wire Transfer - For larger orders we may be able to accept Wire Transfer payment. Please contact our customer service line for more information on this service. International Orders - We will accept international orders paid with PayPal or bank wire. We accept Credit Card payment on orders from Australia and Canada. Please email our Customer Service for bank wire information. Orders of $5,000 or more and / or orders for Waterford Special Order stemware, require a non-refundable depost of 50%. Crystal Classics accepts the responsibility for breakage during shipment to our customers. However, it is important that you notify us immediately upon opening the package if there are any broken pieces. Also, please keep all packaging materials from the shipment. Once you notify us of the breakage, we will replace the broken items at no cost, and retrieve the broken items from you at no cost. We need to be notified of the breakage within 30 days upon the receipt of the merchandise otherwise we are not responsible for the breakage. If you have any broken pieces in your shipment, please send us an e-mail to info@crystalclassics.com and note your name, order number and items broken. We will contact you with replacement instructions the next business day. PLEASE NOTE: We are not responsible for breakage on orders that are shipped outside of the U.S. via a freight forwarder. We will not accept responsibility for breakage during these shipments and can not provide no cost replacements for damaged items. We will gladly print and attach a Gift Message with your personalized sentiment to any order. You can include the message on our checkout/ order form. There is no limit on the size of the message and there is no charge for the computer printed gift message. You can also choose one of our Premium Greeting Cards to be enclosed with the gifts and hand written at an additional charge. We offer custom luxury gift wrapping services for $4.00 per piece. Whether you need one perfect gift or hundreds, leave the wrapping to us! When you are ready to checkout, you will be given the option to add gift wrapping. We offer an elegant silver paper with embossed seals. For more information please visit the Gift Wrapping page. We are able to engrave almost any piece we currently offer. We can engrave your company logo and appropriate message according to your instructions. Please visit our Engraving page for more information on these services. We pride ourselves on accuracy and you can rest assured that your order is in good hands. We automatically check every ZIP code to assure the prompt delivery of your package. Frequently, we attempt to explain the facts of crystal artisanship to customers seeking flawless perfection in the tableware merchandise they buy. In reality, such perfection can be achieved only in assembly line products. Of course, this is not possible or even desirable in quality ware whose manufacture depends so much on the skill and artistry of individual craftsmen. Slight variations in crystal ware pieces are actually a confirmation of fine crafting. Most customers who appreciate fine crystal understand this. No. The tiny "seeds", or bubbles the size of a pinpoint, visible when you examine crystal against a strong light, are formed by gases when chemicals unite in the fusing or melting of the raw ingredients. These bubbles do not affect the quality or the beauty of the glass. No. Each piece of crystal is unique. Slight variations of weight and sometimes height are a sign that each piece truly is individually crafted. A line or "cord" is an almost invisible difference in the density of the crystal that occurs during the fusing of molten crystal. It is visible when it reflects light. But when a goblet with a cord in it is filled with water, no light is reflected, and the cord becomes invisible. Try this: run water that is comfortably warm to your hands on the neck and top of the decanter, or pour warm vegetable oil around the stopper to loosen it. You can avoid the problem by wiping the neck of the decanter with a soft cloth before replacing the stopper. Clean vases and decanters by filling them half-full with moderately hot water, a small amount of mild detergent, two tablespoons of white vinegar or ammonia and a cup uncooked rice. Swirl the rice around for a few minutes to remove residue. Rinse well with moderately hot water and air dry, upside down, on a rack. You can also use our Bottle Cleaner by Riedel. For more information on this product please click here. Remove more stubborn stains by filling the container with warm water and dropping in a denture-cleaning tablet; let it sit until the stain disappears. We do not recommend cleaning crystal in a dishwasher since the heat and abrasive cleaners may mark the surface of the crystal. Read additional care information in the Usage & Care insert shipped with every piece or our Caring for your Waterford Crystal instructions. The size of the chandelier for the dining room typically depends on the size of the dining room table. The general rule of thumb is that the chandelier needs to hang 31 inches above the table surface and be at least 7 inches inside the edge of the dining room table. If a piece of crystal gets broken, it cannot be repaired to as new condition. Crystal Classics does not suggest or endorse gluing or in any manner sticking the pieces together. Chipped glasses can be ground down at some repair shops, however these pieces will have an etched white rim and be considerably shorter than the rest of the pieces. Chipping or breakages are part of normal wear and tear of the pieces, and we suggest replacing them with new ones as they become damaged. Swarovski Silver Crystal pieces and Jewelry that are still active pieces can be repaired by Swarovski. More information on the repair of Swarovski pieces is available on our Swarovski repair page. Do not machine wash metal-accented crystal. Use your dishwasher's "fine crystal and china" setting. Because even the mildest brands of automatic dishwashing detergent are abrasive, use only half the recommended amount. Lower the top dishwasher rack, if possible, to accommodate the height of your crystal, paying special attention to your stemware. Make certain to space your crystal stemware on the rack so the pieces do not touch one another, since vibration during the washing and rinsing cycles can chip or crack the crystal. For dishwashers without a "fine crystal and china" setting, turn on the "air-dry only" cycle and open the door to allow your crystal to air dry. Remember that fine crystal and glassware can crack or break when subjected to extremes of hot and cold. Before putting very warm food or liquid into a crystal container, we recommend you preheat the crystal with moderately hot tap water. Do not pour cold beverages into a pitcher or bowl that's just been washed with hot water. Likewise, do not wash a crystal piece that's just come out of the refrigerator; allow it to warm to room temperature first. Clean vases and decanters by filling them half-full with moderately hot water, a small amount of mild detergent, two tablespoons of white vinegar or ammonia and a cup of uncooked rice. Swirl the rice around for a few minutes to remove residue. Rinse well with moderately hot water and air dry, upside down, on a rack. Do not clean your fine crystal and glassware with scouring pads or abrasive cleaners. Always store your stemware upright to help prevent chipping. These hand-detailed masterpieces have a family tradition of longevity when treated with loving care. Hard glazes give your china durability by design and relieve you of the need for excessive caution. They are, however, vulnerable to scratching by equally hard surfaces. Just as a diamond can be scratched and damaged by another diamond, so it is with fine bone china dinnerware. So be sure, when stacking plates, to separate them from one another by a soft cloth, pad or paper napkin that protects the entire surface, especially the rim. That small bit of insurance will keep the bottom of one plate from scratching the surface of another. It is safe to wash your Fine Bone China in an automatic dishwasher as long as you load it with the dishes fully secured and placed so that they do not touch each other. Do not wash at temperatures higher than 149° Fahrenheit and use the "short wash" or "china and crystal" cycles. The rinse cycle should follow immediately to flush away detergent deposits that could form a film if they remain on the dishes too long. In hard water areas, deposits may form on your china if water is allowed to dry naturally on the plates. Such deposits can be readily removed with a vinegar solution or a mild, acidic cleansing agent. Since it is so lavishly embellished with gold or platinum, you must not place your Fine China in a microwave oven, where the intense heat will damage its high concentrations of precious metal. If your Emeril Dinnerware gets marks on it after many uses, a product called Barkeepers Friend should remove those marks. Barkeepers Friend is a powdered cleanser and can be found in most supermarkets. Waterford Fine Stainless Flatware is dishwasher safe. We recommend using a gentle dishwasher detergent (avoid using lemon-scented products). If possible, set your dishwasher on the fine china setting to insure gentle cleansing. Wash stainless separately from aluminum, sterling or silverplate items, as pitting can occur. Place spoons and forks into baskets with handles facing downward. Knives should be inserted with the blade facing down. Water shedding or drying additives can be used to minimize water spots. Should water spots or stains occur, we recommend using Hagerty stainless steel polish. Also, rubbing alcohol or salad oil can be used to remove stubborn water spots. Shine flatware using a sponge doused in white vinegar. While stainless steel is designed to resist most common stains, corrosion and/or discoloration may be caused due to prolonged contact with chloride rich foods, such as salt, mayonnaise, mustard and eggs. Remove flatware prior to the drying cycles. This decreases the amount of time the flatware spends in a hot, moist atmosphere, and permits the flatware to dry in cool, drier air. Hand drying is also advised. Rinse and dry thoroughly with a soft towel while flatware is still warm. The hand-buffing action helps maintain a lustrous finish and discourages film buildup. Do not rinse and stack. We recommend hand washing gold-accented stainless steel flatware. the grey frosted cuts, to leave them clear and sparkling. This leaves the polished product looking very similar to crystal. Following tastes and trends in home decor, Waterford designers continued creating new and exciting additions to Lismore. In 1996 Waterford introduced Lismore Tall, nearly 45 years later in an updated silhouette with a longer 'statuesque' stem. In 2005, the eternal Lismore pattern changed shape with Lismore Nouveau, featuring the classic cuts on a gracefully curving body. 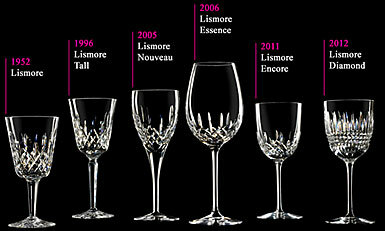 Waterford introduced Lismore Essence Stemware - with classic form and contemporary function - in 2006. For the first time in 2011, the latest Lismore arrivals, Lismore Encore and Lismore Diamond, continue the pattern's on-trend transfigurations and honors this venerable pattern with a new classical interpretation in an updated silhouette and a contemporary version that speaks volumes. In 1991 Waterford introduced Marquis by Waterford Crystal, the first new brand in the company's 200 year-old history. Marquis offers innovative crystal patterns with designs ranging from contemporary to traditional, with lighter, simpler lines that reflect a modern sensibility. Each piece of elegant stemware and giftware accessories is finely crafted under the meticulous eye and exacting standards of Waterford. Several Marquis stemware patterns are available in four shapes -goblet, continental champagne, wine and iced beverage - as well as an array of giftware that can be mixed and matched to create a new standard in contemporary decor. Crystal Classics offers only the finest first class merchandise, in the original boxes, manufactured by reputable vendors. All pieces are manually inspected and are true pieces of premier art. Each piece is made by highly trained craftsmen in their traditional manufacturing process. Some manufacturers have little factory shops located in the originating countries adjacent to the production facilities. The pieces sold there are sometimes slightly flawed, without the original box and unsigned. Crystal Classics does not offer any of these products. If, by any chance, any of our products are returned to us because a customer was unhappy with the quality, Crystal Classics NEVER reships these products to another customer. We send them back to the manfacturer in exchange for another piece. The returned pieces are then destroyed. Pink - Gratitude, "You are sweet"
CALIFORNIA RESIDENTS - PROPOSITION 65 WARNING: Consuming foods or beverages that have been kept or served in leaded crystal products or handling products made of leaded crystal will expose you to lead, a chemical known to State of California to cause birth defects or other reproductive harm. You may return this product for full refund within 30 days, if you wish.. Some manufacturers like Baccarat and Lalique do not allow certain discounts or coupons on their products.